Thousands of people are victimized each year by online scammers who use emotional appeals and urgency tactics to manipulate victims into giving out their personal information and banking account numbers. Mobile phone users, online shoppers, and social network users are all vulnerable to these scammers tactics. These online cons are constantly monitoring places like Craigslist, Facebook, and even message boards to get money or steal identities from unsuspecting people. Here are some of the top scams to watch for and what you can do to protect yourself. The Federal Trade Center (FTC) have been contacted about scammers who are offering to help navigate the new health insurance marketplace under Obamacare for a fee. Some will warn you that you need a new Medicare card, offers for medical discount plans, or are charging for advice to help you enroll in insurance exchanges to avoid penalties in order to obtain your personal information. According to the FTC, the government will not call you about your health insurance and would never ask for you to verify your personal information over the phone. The FTC is asking for reports on any other potential cons and say they will be vigilant on cracking down on these frauds. If you believe you’re a victim, you can make a report by calling 1-800-218-2596 or file a complaint online. If you’ve received an offer about applying for a “pre-approved” loan or credit card that charges a fee upfront, keep in mind that while reputable credit card companies do charge an annual fee, that fee is applied to the balance of the card and never on sign-up. The Better Business Bureau (BBB) has received a number of reports from consumers that lenders are demanding cash upfront for easy loans. Charging an advanced fee is illegal. Many borrowers are victimized by these frauds because of their poor credit history or lack of collateral. Claire Rosenweig, president of the BBB serving Metropolitan New York told the Daily News that, “The bottom line is any time someone is asking you to pay in advance for aloan or credit card, it’s bad news. Be wary of lenders who aren’t interested in your credit history or a loan that is offered over the phone as it is illegal for companies in the U.S. to promise you a loan or credit card and ask you to pay before they deliver. Get the company’s name and phone number and look them up in directory assistance to confirm they are legitimate. 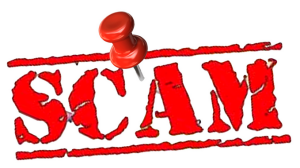 If you feel you’ve become a victim of this scam, you can file a complaint at bbb.org. You can also file a complaint with the Federal Trade Commission (FTC) and the attorney generals office. Phishing is typically done via email, phone or website and solicits social security numbers, bank account information, credit card numbers and other confidential personal information by enticing victims to click on what looks like legitimate images for credit authorities like Citibank, eBay, or PayPal which then require you to enter your ID and password along with filling out other personal information. The email message will require that you to click on a link but instead of directing you to the real login https: site, the link will redirect you to a fake website. These are the most common and widespread internet and email scams that are victimizing people on a daily basis. Use extra caution when clicking images or links in your emails. The link address should begin with https://. fake addresses will have http:// with no “s” at the end. If you’re just browsing the web and not entering any sensitive information, http:// is just fine. However, on pages that you enter your password, credit card number, or other financial information, you should always look for the https:// prefix. If you don’t see the “s,” don’t enter any information that you want to keep secure. If you’re not sure of the authenticity of the email, view it in plain text format so you can see the URL’s that the images are pointing to. If you have any doubts, you can call the financial institution the email is coming from to find out if it’s legitimate. If you determine the email is a fraud, delete the message from your inbox and then empty it from your trash. If you’ve become a victim of online fraud and identity theft, there are several organizations that can help. The Better Business Bureau and National Consumers League offer information on how to report these crimes. The Federal Trade Commission handles complaints about unfair business practices. You can file a complaint at www.ftc.gov/ftc/contact.shtm. You can also file a report with the Internet Crime Complaint Center which is a partnership between the Federal Bureau of Investigation and the National White Collar Crime Center at www.ic3.gov. If your complaint has to deal with a company in a foreign country, you may be able to file a report at www.econsumer.gov. Of course, you can also hire us to resolve your credit report issues. Act fast – often the longer those errors are on your report, the more damage they can do. Don’t let yourself become a victim. When in doubt, play it safe. It’s best to be skeptical and take the time to do a little research if you feel something just isn’t quite right. Arm yourself with a comprehensive anti-virus system, keystroke-loger protection, common sense and knowledge which is truly power in these cases.